Whenever you think about the Costa Blanca and cities like Benidorm, Calpe, Altea or Alicante, you most certainly think about hot summer vacations.Lying on the sandy beaches at incredibly high temperatures. 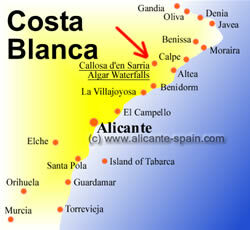 But there is much more to the Costa Blanca than flights, hotels, sand and nightlife. A bit off the coastline, about 10 km from Altea and only 15 km from Benidorm you find the village of Callosa de’n Sarria. Just nearby lies the impressive waterfall of Algar. The Fuentes del Algar should be on the top of your list for places to visit whilst you are around the area. Not only do they offer a sharp contrast to the normal days at the beach, but furthermore they show you a different, very quiet and even cool Spain. On one of our last visits during a hot summer months, the river still had only 18 Celsius. 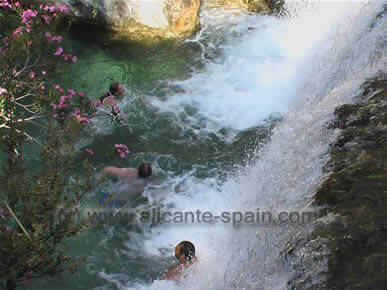 The Algar riverside is a very nicely maintained area with pathways along the various waterfalls and natural pools. The impressive landscape surrounding the river. Oh yes, its big fun to jump into an ice cold sweet water river. Well, at least during very hot summer days. Driving to Algar from Altea or Calpe drive the N-332 road to Urbanizacion Sierra Altea, where you take the CV-755 which gets you directly to Callosa d’En Sarria (which is just 2 minutes from the waterfall). or if you come from Benidorm take the CV-715 via La Nucia and Polop gets you directly to this lovely place. Parking is no problem. Plenty of parking lots when you enter the village of Algar. There are two different entrance to the waterfall area. One at the center of the village and another at the very end. So you can pass through Algar and parking grounds at the second entrance. Entrance Fee or better said admission fee is around 3 Euros. Absolutely worth it, as the place is well preserved and even life guards are on duty. Clothing: Take your bathing suit and a pair of good shoes would be useful, as the river is full of stones. Outside the waterfall area, at the second entrance area, is an additional picnic and barbecue area. Well preserved with a little camping ground. Apart of the beautiful waterfall area, just at the second entrance two museums are located. The Environment Museum and the Water Museum round up this perfect day trip into the beauty of nature. Together with a little pathway through a garden of aromatic plants, the entire day should be a nice and recharging some energy for the often stressed tourist days and nights around the Costa Blanca.